At BrandDirections, we believe pro bono partnerships are a win-win-win – for your business, the nonprofit and the community. For many years, we have partnered annually with area nonprofit organizations as a way to give back to the community that has helped us achieve over 60 years of success. We feel honored to have provided our marketing, design and P.R. expertise to help these organizations fulfill their missions and to create a stronger, healthier community. Our 2016 partner is Best Friends of Neenah-Menasha, an organization dedicated to helping young people thrive through the power of mentoring. Best Friends came to BrandDirections seeking promotional support for its Gourmet Bike Tour, an annual event and a significant fundraiser for the organization. The event features a ride through the local countryside – participants choose from a variety of routes – followed by a gourmet picnic. Initially, the group requested help to design a new logo to refresh the look of the 30-year-old event. However, once our design team sat down with the Best Friends staff, we learned that the organization needed additional support to promote and increase awareness about the event. The goal was to develop a logo unique from previous years that incorporated many different messages, yet held together as a single event logo. It had to represent a bike tour (of course), gourmet foods (the tour theme), the Best Friends logo, and that the event was celebrating its 30th year. By melding a waiter and a bicycle into one graphic, selecting typography that had a stylized, formal yet still casual feel and leaving a spot to nest the Best Friends logo, we were able to accomplish this goal. The colors needed to have an upscale, gourmet feel, with appetite appeal but still have a sense of fun. 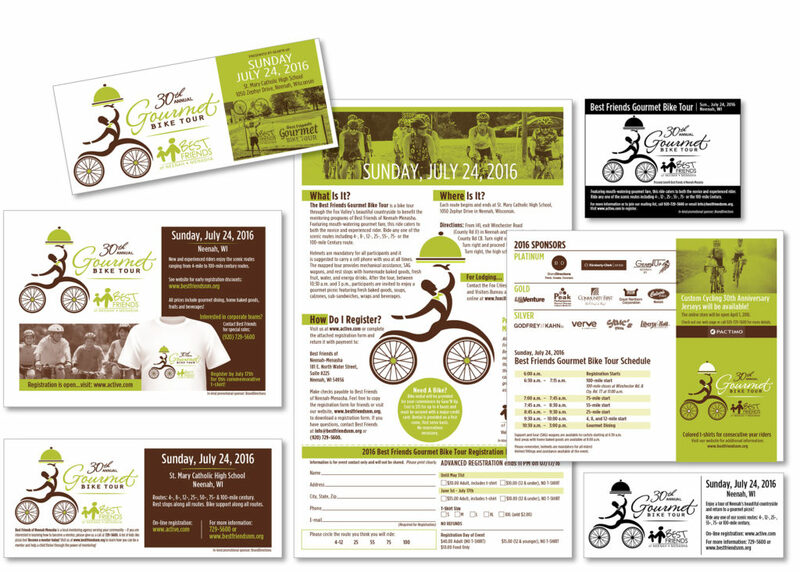 The logo, typography, and colors carried over well into attention-getting marketing materials that included a brochure, Save the Date postcard and a bank stuffer – certain to get noticed in the clutter of everyday mail. We also incorporated the design into a half-page ad and a pizza box flyer. In addition to providing design support, members of our team will be at the event (coming up on July 24), manning a table at Marker 12, offering water and food to participants and of course, cheering them on.